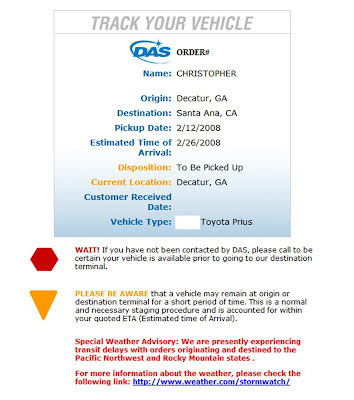 DAS, the shipping company, allows customers to track their cars as they make their way across country. I'll keep you updated on the prius' progress.. It's a gamble when it comes to purchasing cars over the internet but there are a couple things you can do to make sure that you're working with a reliable seller. Firstly, go with an auto dealer, not an individual owner. Ebay allows you to rate sellers. Anyone with a rating of less than 98% probably isn't a good person to work with. You can also read the comments posted by buyers about the seller. If you see stuff like: "Sold me a lemon" or "didn't return phone calls", it tends to be a bit shady. Sellers are deathly afraid that you'll write a bad review of their product so they usually bend over backwards to accommodate your requests and provide you with lots of information. Consequently, you'll find that sellers are pretty honest when it comes to talking about problems with the car. If not, you can write a horrible review and take legal action through Ebay. Most of the car dealers sell their cars only through Ebay so if they sell a lemon to a customer and Ebay revokes their right to sell cars on the website, they've pretty much just destroyed the entire business of the seller. You should also always run a carfax report on the car's VIN and ask to see all records of car repair and/or maintenance. One scam that was happening was that people were selling Katrina cars from New Orleans on ebay. In our case, the seller has all the records of purchase, repair, and registration (all in Georgia). This is essential and means that it probably wasn't a flood victim. Be especially careful of this when buying used cars in Texas. Of course, the down side of Ebay is that you can't test drive the car or look under the hood. That's a huge risk, especially since most dealers won't know if there are mechanical problems or other significant issues. That's why it's good to buy a newer car with fewer miles and often they are under warranty. 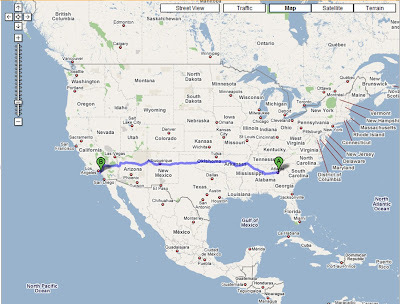 We could purchase a prius for 4 to 6 thousand dollars cheaper in Georgia than we could in California. So, even with subtracting the $800 that it will cost to ship it out here, you still have some significant money left over for doing any repairs that might be required. It's a gamble, true, but there are ways to hedge your bets.